Judge blocks the Obama pompous self glory park in Chicago. Just like in his token Presidency with the American people, Obama is trying to take advantage of Chicago's poor with his pagan monument to himself. A judge has blocked Obama's ridiculous 500 million dollar self tribute. Citing the irregularities in the way the city bent over for the Kenya native. Judge Blakely was appointed by Obama too. Just rerouting the streets would cost 175 million. The Obama alter will most likely be built somewhere else for another reason too. His alter of self praise would block residents from utilizing the park as a recreational site. It's justice that the judge was the Kenyans appointment. 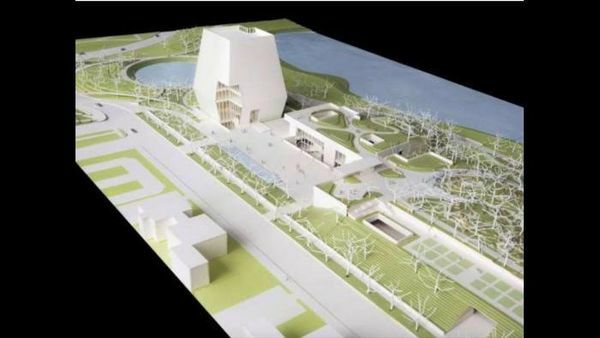 It sure is ugly and not even really a presidential library. Of course it isn't about taste..
A thug in a suit. He most likely won't give in easily though and move his Temple to a more suitable part of Chicago. That is a decent idea. Where did they ever find a judge to oppose Obama ? The fun part is....Obama appointed this judge Blakely. I heard Stephen King is building it for him in California. There or Kenya would be fitting. Build it on the pooh streets of California. By the way, Pelosi clean up your streets. I lived in Cali for 29 years, went to Frisco a few times, for some reason even back then it felt strange. I can't think of a reason to ever go there again. The fact that defecation on the sidewalks is permitted, is very telling of the city's character.